Nicki Minaj and Jay-Z, who was not in attendance at the awards, proved to be the night's biggest winners as they took home multiple awards. Nicki Minaj made sure to thank her "Barbies" as she accepted the award for "Favorite By Fans." "I feel overwhelmed, you know, coming out with Big Boi from OutKast and doing our record. I never thought it would lead to here, but I'm taking it in. I'm happy and I'm honored to be a part of it," Yelawolf explained to The BoomBox. The Hip-Hop Awards cypher's proved yet again to be one of the highlights of the show with a number of artists taking part in this Hip-Hop Awards staple. Kanye West gave folks a taste of G.O.O.D. Music with a cypher that featured verses from himself, Common, Big Sean, Pusha T, and Cyhi Da Prynce. Ice Cube and Rev. Run kept it all in the family with a cypher that consisted of performances from Diggy Simmons, JoJo Simmons, OMG, and Doughboy. 2010's BET Hip-Hop Awards took place on Oct. 2, 2010 in Atlanta. NEW YORK - AUGUST 28: Busta Rhymes performs during the 7th Annual Rock The Bells festival on Governors Island on August 28, 2010 in New York City. NEW YORK - AUGUST 28: Method Man of Wu-Tang Clan performs during the 7th Annual Rock The Bells festival on Governors Island on August 28, 2010 in New York City. NEW YORK - AUGUST 28: Wu-Tang Clan of Wu-Tang Clan performs during the 7th Annual Rock The Bells festival on Governors Island on August 28, 2010 in New York City. NEW YORK - AUGUST 28: (L-R) Spliff Star, Q-Tip, Phife Dawg and Jarobi White perform during the 7th Annual Rock The Bells festival on Governors Island on August 28, 2010 in New York City. Recording artist Snoop Dogg performs during the 7th Annual Rock The Bells festival on Governors Island on August 28, 2010 in New York City. NEW YORK - AUGUST 28: Boots Riley (L) and Tom Morello of the Street Sweeper Social Club performs during the 7th Annual Rock The Bells festival on Governors Island on August 28, 2010 in New York City. NEW YORK - AUGUST 28: Recording artist Brother Ali performs during the 7th Annual Rock The Bells festival on Governors Island on August 28, 2010 in New York City. NEW YORK - AUGUST 28: Lady of Rage performs during the 7th Annual Rock The Bells festival on Governors Island on August 28, 2010 in New York City. NEW YORK - AUGUST 28: Phife Dawg and Q-Tip of A Tribe Called Quest perform during the 7th Annual Rock The Bells festival on Governors Island on August 28, 2010 in New York City. NEW YORK - AUGUST 28: Recording artist Ill Bill performs during the 7th Annual Rock The Bells festival on Governors Island on August 28, 2010 in New York City. Other cypher participants included YelaWolf, Raekwon, Diamond, Fonzworth Bentley, Wiz Khalifa, Free Style Friday champ Bones Brigante, and more. "My favorite cypher was the one that Juelz, Jada, and Fab did cause that was real New York heavy and they went crazy in that," said Brigante in regards to past cyphers. "I like what Eminem did last year, but hopefully I can bring something else to that real rap." Towards the end of the show veterans Salt-N-Pepa along with Spinderella were honored with the prestigious "I Am Hip-Hop" award. "That was the first song I ever learned was 'Push It.' When I was a little baby my mom said I used to be in the car seat just 'Ah, push it.' All the time," R&B singer Lloyd told The BoomBox. Fresh off a performance for President Barack Obama last week in Washington D.C., Atlanta rapper B.o.B brought the crowd to their feet with a moving performance of "Don't Let Me Fall." Other performer's included Waka Flocka, Soulja Boy, J. Cole, and Dipset. This year's BET Hip-Hop Awards concluded with Cali Swag District performing their dance hit "Teach Me How To Dougie." Following their performance Cali Swag went on to introduce Digital Underground who then performed their classics "Humpty Dance" and "I Get Around" featuring the late Tupac. 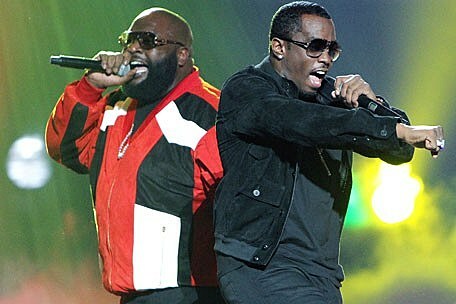 The 2010 BET Hip Hop Awards will air on BET on October 12 at 8 PM.